The True Origin of The Hebrew Peoples. (1071.6) 97:9.1 There never were twelve tribes of the Israelites ? only three or four tribes settled in Palestine. The Hebrew nation came into being as the result of the union of the so-called Israelites and the Canaanites. ?And the children of Israel dwelt among the Canaanites. And they took their daughters to be their wives and gave their daughters to the sons of the Canaanites.? The Hebrews never drove the Canaanites out of Palestine, notwithstanding that the priests record of these things unhesitatingly declared that they did. 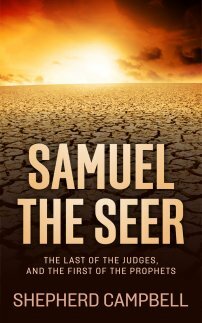 (1072.1) 97:9.3 Pretentious Hebrew history begins with Saul's rallying the northern clans to withstand an attack by the Ammonites upon their fellow tribesmen ? the Gileadites ? east of the Jordan. With an army of a little more than three thousand he defeated the enemy, and it was this exploit that led the hill tribes to make him king. When the exiled priests rewrote this story, they raised Saul's army to 330,000 and added Judah to the list of tribes participating in the battle. (1072.2) 97:9.4 Immediately following the defeat of the Ammonites, Saul was made king by popular election by his troops. No priest or prophet participated in this affair. But the priests later on put it in the record that Saul was crowned king by the prophet Samuel in accordance with divine directions. This they did in order to establish a ?divine line of descent? for David?s Judahite kingship. (1072.3) 97:9.5 The greatest of all distortions of Jewish history had to do with David. After Saul?s victory over the Ammonites (which he ascribed to Yahweh) the Philistines became alarmed and began attacks on the northern clans. David and Saul never could agree. David with six hundred men entered into a Philistine alliance and marched up the coast to Esdraelon. At Gath the Philistines ordered David off the field; they feared he might go over to Saul. David retired; the Philistines attacked and defeated Saul. They could not have done this had David been loyal to Israel. David?s army was a polyglot assortment of malcontents, being for the most part made up of social misfits and fugitives from justice. (1072.4) 97:9.6 Saul?s tragic defeat at Gilboa by the Philistines brought Yahweh to a low point among the gods in the eyes of the surrounding Canaanites. Ordinarily, Saul?s defeat would have been ascribed to apostasy from Yahweh, but this time the Judahite editors attributed it to ritual errors. They required the tradition of Saul and Samuel as a background for the kingship of David. (1072.5) 97:9.7 David with his small army made his headquarters at the non-Hebrew city of Hebron. Presently his compatriots proclaimed him king of the new kingdom of Judah. Judah was made up mostly of non-Hebrew elements ? Kenites, Calebites, Jebusites, and other Canaanites. They were nomads ? herders ? and so were devoted to the Hebrew idea of land ownership. They held the ideologies of the desert clans. his brethren and proceeded formally and by elaborate and solemn ceremonies to anoint him king over the Hebrews and then to proclaim him Saul?s successor. (1072.7) 97:9.9 So many times did the priests, after preparing their fictitious narratives of God?s miraculous dealings with Israel, fail fully to delete the plain and matter-of-fact statements which already rested in the records. (1072.8) 97:9.10 David sought to build himself up politically by first marrying Saul?s daughter, then the widow of Nabal the rich Edomite, and then the daughter of Talmai, the king of Geshur. He took six wives from the women of Jebus, not to mention Bathsheba, the wife of the Hittite. (1073.1) 97:9.11 And it was by such methods and out of such people that David built up the fiction of a divine kingdom of Judah as the successor of the heritage and traditions of the vanishing northern kingdom of Ephraimite Israel. David?s cosmopolitan tribe of Judah was more gentile than Jewish; nevertheless the oppressed elders of Ephraim came down and ?anointed him king of Israel.? After a military threat, David then made a compact with the Jebusites and established his capital of the united kingdom at Jebus (Jerusalem), which was a strong-walled city midway between Judah and Israel. The Philistines were aroused and soon attacked David. After a fierce battle they were defeated, and once more Yahweh was established as ?The Lord God of Hosts.? (1073.2) 97:9.12 But Yahweh must, perforce, share some of this glory with the Canaanite gods, for the bulk of David?s army was non-Hebrew. And so there appears in your record (overlooked by the Judahite editors) this telltale statement: ?Yahweh has broken my enemies before me. Therefore he called the name of the place Baal-Perazim.? And they did this because eighty per cent of David?s soldiers were Baalites. (1073.3) 97:9.13 David explained Saul?s defeat at Gilboa by pointing out that Saul had attacked a Canaanite city, Gibeon, whose people had a peace treaty with the Ephraimites. Because of this, Yahweh forsook him. Even in Saul?s time David had defended the Canaanite city of Keilah against the Philistines, and then he located his capital in a Canaanite city. In keeping with the policy of compromise with the Canaanites, David turned seven of Saul?s descendants over to the Gibeonites to be hanged. (1073.4) 97:9.14 After the defeat of the Philistines, David gained possession of the ?ark of Yahweh,? brought it to Jerusalem, and made the worship of Yahweh official for his kingdom. He next laid heavy tribute on the neighboring tribes ? the Edomites, Moabites, Ammonites, and Syrians. (1073.5) 97:9.15 David?s corrupt political machine began to get personal possession of land in the north in violation of the Hebrew mores and presently gained control of the caravan tariffs formerly collected by the Philistines. And then came a series of atrocities climaxed by the murder of Uriah. All judicial appeals were adjudicated at Jerusalem; no longer could ?the elders? mete out justice. No wonder rebellion broke out. Today, Absalom might be called a demagogue; his mother was a Canaanite. There were a half dozen contenders for the throne besides the son of Bathsheba ? Solomon. (1073.6) 97:9.16 After David?s death Solomon purged the political machine of all northern influences but continued all of the tyranny and taxation of his father?s regime. Solomon bankrupted the nation by his lavish court and by his elaborate building program: There was the house of Lebanon, the palace of Pharaoh?s daughter, the temple of Yahweh, the king?s palace, and the restoration of the walls of many cities. Solomon created a vast Hebrew navy, operated by Syrian sailors and trading with all the world. His harem numbered almost one thousand. Comments for The True Origin of The Hebrew Peoples. (1071.6) 97:9.1 There never were twelve tribes of the Israelites ? only three or four tribes settled in Palestine. The Hebrew nation came into being as the result of the union of the so-called Israelites and the Canaanites. ?And the children of Israel dwelt among the Canaanites. And they took their daughters to be their wives and gave their daughters to the sons of the Canaanites.? The Hebrews never drove the Canaanites out of Palestine, notwithstanding that the priests? record of these things unhesitatingly declared that they did. (1072.1) 97:9.3 Pretentious Hebrew history begins with Saul?s rallying the northern clans to withstand an attack by the Ammonites upon their fellow tribesmen ? the Gileadites ? east of the Jordan. With an army of a little more than three thousand he defeated the enemy, and it was this exploit that led the hill tribes to make him king. When the exiled priests rewrote this story, they raised Saul?s army to 330,000 and added ?Judah? to the list of tribes participating in the battle.